Pioneer Car Wash and Detail offers a wide range of services to fit every need, whether you're the do-it-yourself type or if you like to have your vehicle cleaned for you. Not a do it yourself type? We offer complete full service detailing while you wait. Hand wax, interior shampoo, and leather treatments. Our expert staff will make you car shine like it just rolled off the showroom floor. Have a boat? We do boats also! Pioneer Car Wash is ready to help you with scratch removal and oxidation reversal. At Pioneer Car Wash, we have sought out the finest materials and most revolutionary equipment that the industry has to offer. Our search led us to Ryko's FoamBrite Rollover Car Wash System. The FoamBrite wash material, a revolutionary wash product, actually enhances the shine of a vehicle's finish with repeated washings. The closed-cell copolymer material prohibits small particles of dirt from embedding, eliminating scratches. This feather-light fabric is both pliant and supple, yet durable and forgiving. Ryko FoamBrite systems are designed specifically for FoamBrite use. FoamBrite brings back the hidden luster of the vehicle surface. This insures that your car will receive a superior wash each and every time you clean your car. We feature a Thrust Pro dryer, the ultimate in drying performance. For a touchless wash, Pioneer Car Wash & Detail features the US2001 Overhead System from Ryko. This system was built around the concept of high pressure and high volume. The overhead gantry utilizes a halo motion application of tri-foam wax, freshwater rinse, and a clear coat solution. The system also has powerful oscillating rocker/wheel blasters and undercarriage wash. There are no guide tracks, as the US2001 comes equiped with a high-tech vehicle detection system. It accurately locates and sizes the vehicle in order to provide the optimum wash. We feature a Thrust Pro dryer, the ultimate in drying performance. Complete wash in about two minutes. Our four self-serve wash bays feature the premire Ryco Signature Series self-serve equipment. We feature tri-foam waxes and clear coat protectants. We have gentle hog hair brushes and the highest quality of waxes and chemicals, giving you the best wash everytime. The self-serve bays are well lit, always clean, open 24-7. Avoid the mess and hassle of cleaning your dog at home. Pioneer Car Wash has installed two pet wash areas with elevated wash basins. The cleaning system features warm water, shampoo, and air dryers. We feature hypo-allergenic shampoos and solutions that will make your pet smell and look great. Easy and convenient for you, and your pooch will love it! Need a gift idea? Don't like the hassle of coins or tokens? 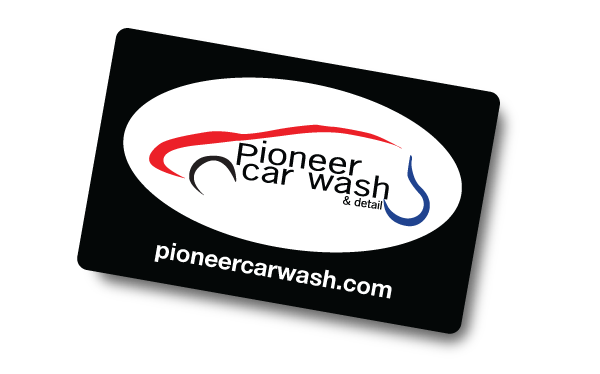 Pioneer Car Wash & Detail offers gift cards that can be purchased for any amount, and best of all they are reloadable. So forget about coins and tokens, load up a gift card today, making you car wash experience easy and convenient. Help draw attention to your business or organization by maintaining a clean fleet of company vehicles. When the public sees that you have pride in your company vehicle, it relects upon the amount pride you take in the product or service you offer. As a business owner, we know how limited your time can be. So let us help out! Set up a fleet account with Pioneer Car Wash & Detail. You'll be glad you did.